So you've got this really obnoxious “friend” on Facebook and all they do is post lame game requests, or memes that you've seen 15 times already. What can you do? 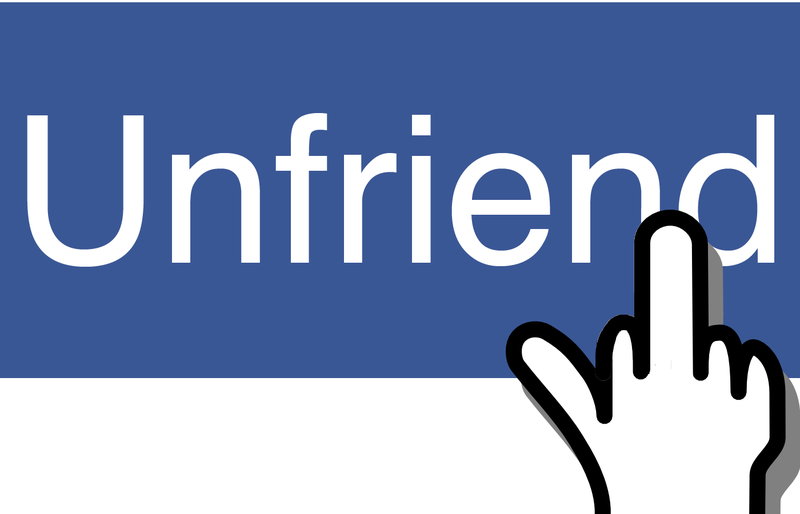 Unfriend is the classic option, if you unfriend a person they become just like the other 999.99 million strangers who use Facebook. You can see their public posts. Their comments on friends posts will still appear in your feed, but their posts won't clutter your feed. Likewise they will only see your public posts, and then only if they follow you or go to your profile page. Unfriend can be as much a political statement as a technical option. Useful for: People who you can’t remember having ever actually met and don't recall why they were “friends” in the first place. Unfollow is much more subtle, you can think of it as unfriend-lite. When you unfollow somebody their posts stop showing up in your feed. Your posts will continue appear in theirs (unless they unfollow you). They won't know you unfollowed them. This means you can avoid the social repercussions that might come with blocking your partner’s favorite aunt for posting the same discredited viral meme ten times this month. Useful for: Turning down the volume on people whose signal is all noise. Getting or Turning off notifications is an option at applies to a single post or person. For a post it controls facebook telling you about new comments or likes on that post. For a person “Get Notifications” causes Facebook to notify every time the post something, “Turn Off Notifications” disables that. Useful for: Muting conversations that have gone way off topic, or conversely following comments on a thread without liking or commenting yourself. Restricted is one of the most useful and least known Facebook features. Even though they are notionally friends restricted users only see your public posts. Restricted is mostly used for limiting what family members or work colleagues can see. You continue to be friends with the restricted person, you still see their posts, and can still interact. They will not know they are restricted unless they notice that they are only seeing your public posts. Useful for: Avoiding upsetting the religious or political sensibilities of your in-laws, and not having your mom or boss comment on your drunken party pics. Blocking is the nuclear option. Once you block somebody it’s as if you no longer exist to each other. You can't see their profile or their comments on other people's posts (this makes some comment threads look really odd because people are responding to things you can’t see). Blocking, like unfriending, is symmetrical so they don't see you either. You can still stalk their public posts, and they yours, by logging out (or using incognito mode) and looking at their profile. Useful for: Crazy ex’s and people who refuse to acknowledge reality and who are incapable of shutting up about it. Hide all from is the equivalent of block, but for pages instead of people. If you find your feed is full of stolen meme graphics and copyright violation videos posted by radio stations (who really should know better about copyright) then “hide all from” is for you. The hide all from option is in the menu under the small V at the top right of a post. Useful for: Improving the overall quality of your feed by permanently removing current and future content from annoying pages. 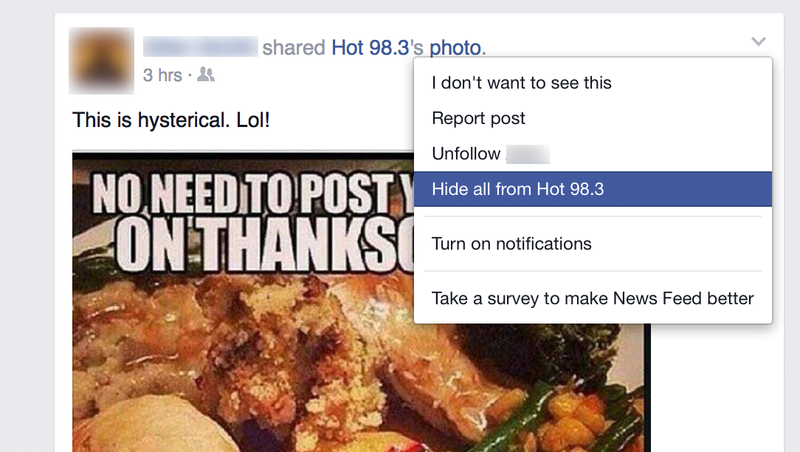 Aggressive use of “hide all from” can significantly improve the overall quality of your Facebook feed. I will be writing a followup article on how to segment your friend list for better control of post privacy. I start tech companies, I create tech, and I have strong opinions. Occasionally I’m right.